Is It Really the Most Important Meal of the Day? Do you need to eat breakfast in Las Vegas? How do you start the day in Las Vegas? Well, look at the person next to you, if you recognize them you're off to a good start. Now, start your day with a good meal, breakfast is the most important meal of the day, right? Here is a list of a few places that are cheap and some are outrageously expensive but they each do the trick. Before you scroll through you should also consider Eggslut at Cosmopolitan, EAT in Downtown Las Vegas, Veranda at the Four Seasons, and MOzen Bistro at Mandarin Oriental. If you happen to wake up around 3 pm, don't worry about breakfast. You should just start the party all over again. If that is the case grab a burger or some pizza and then find a new place to star your party in Las Vegas. DO NOT SKIP BREAKFAST IN LAS VEGAS. If you even attempt to miss the most important meal of the day there is a good chance that you'll miss the smash browns at Pantry. You'll miss the buttermilk pancakes. You'll miss the sweet and savory treats on this menu and then you'll never really experience happiness by way of breakfast food. Don't worry, they are open 24 hours a day so go ahead and sleep in. Breakfast delivered to your senses in such a way that your body will refuse to ever eat a morning meal anywhere else. It's the best breakfast in Las Vegas because everything is done precisely as it should be. 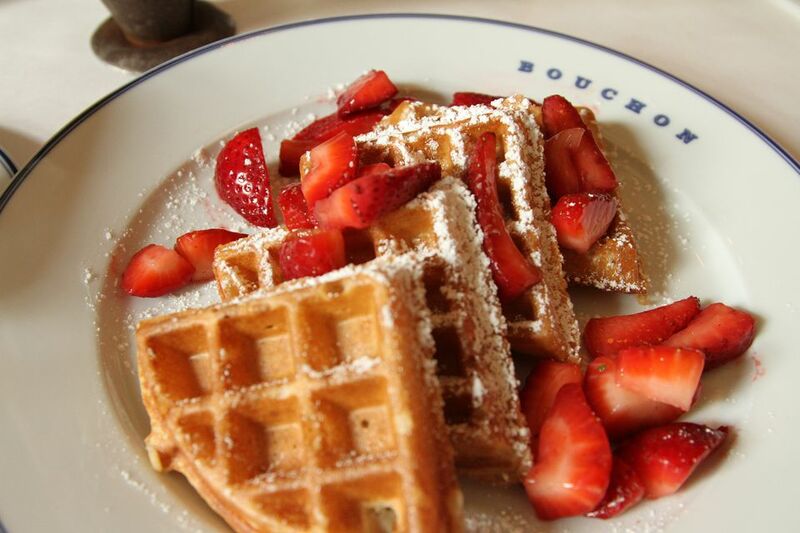 If breakfast is the most important meal of the day then you should start it at Bouchon because your day will be set off with perfection. Service, food, atmosphere. It is the complete package. There is a spot in West Maui where I can indulge in two giant banana Macadamia nut pancakes along with this creamy, buttery, macadamia, sweet happiness that I pour over the top that is reason enough for me to hop on a flight and head across the Pacific Ocean. I don't have to anymore. Well, I still want to head to Maui but if I'm looking for breakfast I can head to Citizens at Mandalay Bay and have what I need. Take in the sunshine and a Bloody Mary cart and your body will be ready to take on another Las Vegas adventure. Gravy! At Hash House A Go Go, breakfast is elevated to a huge platform where you can feast for hours until your jeans pop a button. Lots of flavor, a lot of food, and when you share you end up saving money. At breakfast, order a side of biscuits and you won't have to pay a split charge. Take a seat on the patio, order an omelet, a bowl of fruit, a giant sticky bun, and drink way too much coffee. I'm not sure you can find a better place to see Las Vegas in the morning on the Las Vegas strip. The patio is feet away from the Las Vegas strip so the sidewalk is populated with all the action that great people watching requires. The people who decide they'll run every morning they are in Las Vegas, the walk of shame crowd, the guy and girl who fell in love the night before, the three drunk guys who are walking back to their room after a very long night. Find Jean Phillipe at the Bellagio or Jean Phillipe at Aria Resort and indulge your cravings. Indulge in the croissants, the chocolate pastries, and the sticky buns, and then indulge some more in the crepes and the sandwiches. Sit at the large booths and look around at the décor and try not to judge and instead feel it. That is what Las Vegas was once like before corporate America came in and decided to run the casinos. The Country Club at Wynn will impress you simply because the place looks great, the view of the golf course is very un-Vegas and the customer service is even a notch above the regular Wynn hospitality standard. What you don't realize when you are having a great time listening to some Sunday morning Jazz is that the food is really on a different level. This is breakfast for the privileged so treat yourself to an amazing meal and morning. You can listen to a Volcano as you sip your coffee at this location just down the street from an erupting volcano on the Las Vegas strip. Denny’s is a simple, casual, dining room that serves good food at reasonable prices. If you are looking to save a few dollars while in Las Vegas Denny’s might be an option. With locations right on the Las Vegas strip they are very convenient.